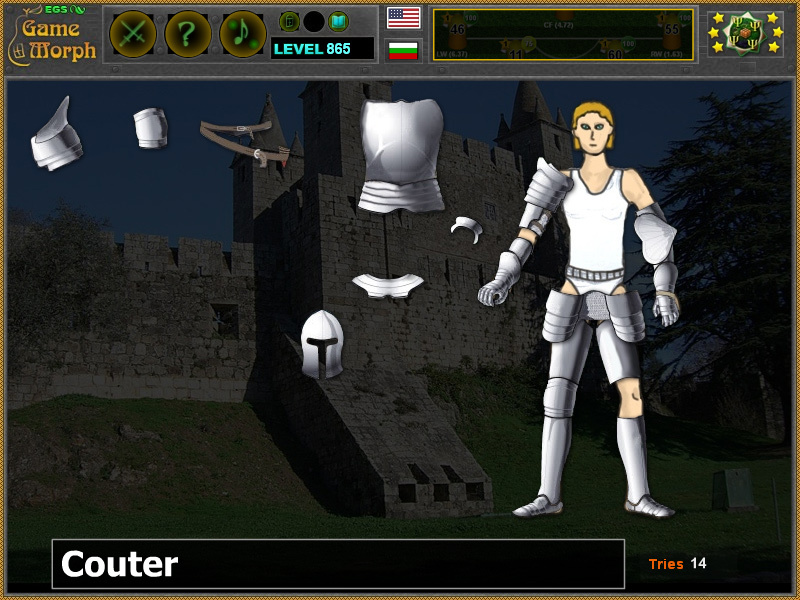 Components of medieval armour and armor parts in a fun online history learning game. which may be played in the web browser. The History Knowledge Board include 18 pictures and names of the armor structure to play with. What are the parts of the medieval armour? What is the structure of the knight armor? Which are the components of the knight armour? What is the name of the armor covering the shoulders? How are the knight gloves called? What is the name of the knight shoes? How to play Knight Armour Puzzle. This is a small drag and drop puzzle. Dress up the knight, placing the armour parts in correct places. Know at least 5 medieval armour parts and get +1 Knowledge Level. Class subject: Components of medieval armour. This small fun puzzle will test your medieval knowledge. You probably know the knight armor parts from those cool role playing games. 1. Helm - Armor for the head. 2. Cuirass - chest armor. 3. Gorget - Neck defense. Armored collar made from hinged plates or laminations. 4. Pauldron - Shoulders. Vest-like shoulder armor which added some protection over the breastplate and across the upper back. 7. Gauntlet - Armored glove. 8. Vambrace - Forearm shielding. This term is sometimes used to refer to the entire arm defense, which is divided into upper and lower cannons. 9. Couter - Armored elbow guards. 10. Rerebrace - Armor shielding of the upper arm. The rerebrace is also referred to as the upper cannon. 11. Faulds / Tasset - Armor, usually composed of lames, which attached to the breastplat, serving to protect the abdomen. 12. Cuisse - Armor of the thigh. 13. Poleyn - Cup-shaped armor knee-guards, often equipped with fan-plates. 14. Greaves - Armor of the lower leg. 15. Sabatons - Articulating foot armor. Some designs even included long dagger-like toe projections. Labels: History Games , Dressing Games , Puzzle Games , Flash Games , Knowledge Games , Education Games , Free Online Games.